There is something inherently exciting about prospects. They offer hope for the future. Fans and coaches dream of what’s to come, envision the metamorphosis of raw potential to production. On Sunday night in Vancouver, Derrick Jones’s journey began. For the first time in franchise history, the Philadelphia Union featured an academy product in the starting XI. Traveling 3,000 miles across the continent, Jim Curtin was hoping Vancouver’s exceptional pace wouldn’t expose the rookie whose role was to provide cover for the defense. Derrick Jones was the best Union player on the field. The midfielder was a force in the center of the pitch as he won a game-high four tackles. 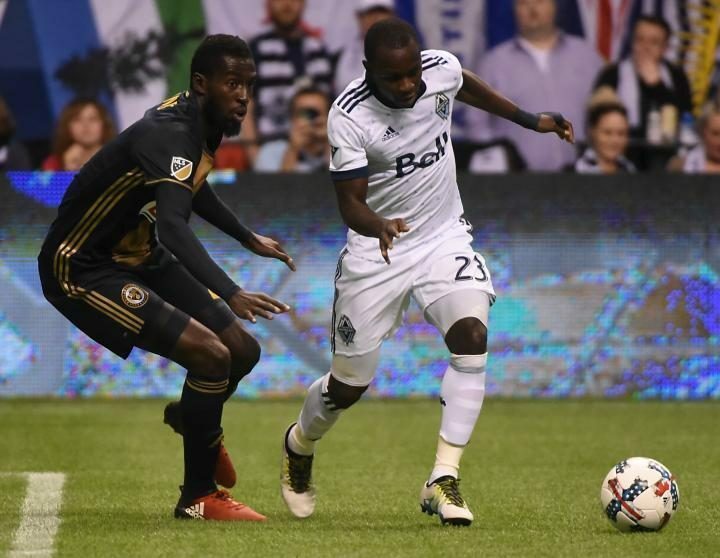 Jones was instrumental in limiting Vancouver to 61% completed passes in the attacking half. The home side only registered a single shot on net, which came from a corner. Jones’s athleticism was never a question. His speed and movement around the field have always been evident. More surprising, however, was the poise he displayed. Jones brought a calming influence to the midfield, which is normally not expected from a homegrown player making his professional debut. The rookie looked every bit the veteran his midfield partner, Haris Medunjanin, is. The duo was dynamic in a unique way. Jones put in the running and gritty defensive work. Medunjanin’s distribution was excellent, as he completed 88% of his passes. Both players read each other well. As one ventured forward, the other shielded the backline. Neither player allowed his positioning to be compromised. It was only one game, but Curtin has reason to be optimistic about the base of his midfield. While Jones is our player of the week, there is still plenty to remember. The Union played a conservative game. They were hesitant to fully commit going forward and expose themselves to counterattacks. Chris Pontius, Fabian Herbers, and Alejandro Bedoya had a lot of defensive duties, protecting Jones and Medunjanin in the same way the two protected the defense. Vancouver was not playing with the same energy they displayed Thursday night against the Red Bulls. Tired legs can dull a team’s attacking edge. Derrick Jones has shown a vast improvement in his passing since we first saw him against the Rowdies in Tampa as his ball movement was calm and collected on Sunday. There is still room for improvement. Against the Whitecaps, it was at 72 percent. Only Pontius’s accuracy was worse among outfield players for the Union. Jones has markedly improved each game with the Union. It is that progression, not just this game, which offers the most hope for his future. This Saturday, Philadelphia plays their first home game of the campaign. While Vancouver brought speed, Toronto brings so much more. The defending Eastern Conference champions boast a trio of the best MLS has to offer. If Derrick Jones can contain Michael Bradley, Jozy Altidore, and Sebastian Giovinco, Philadelphia will know they have something truly special. Nick Brison. The Kennett Square teenager and product of the Southern Chester County Soccer Club scored a hat trick Sunday for the Eastern Pennsylvania Under-17 Boys ODP team to lead his side to a stunning 7-0 win in the 2017 US Youth Soccer ODP Championship in Phoenix. Agree with this pick, and with the assessment that he was the best player on the pitch for the U. As I mentioned on another thread, if he keeps this up, he’ll be the Zac Prescott to Mo Edu’s Tony Romo. I would give an honorable mention to Blake as well. He didn’t make any saves but he made some good decisions and showed poise on the balls he was able to get to outside the box which would have been trouble if he had stayed at home in goal. TBH it was evident for me against Crystal Palace this guy was ready to go. Never saw a practice or a game in Lehigh but his comfort and control against a big and fast and powerful Premier League team, even in the preseason, was eye opening. Looking for tidiness with his passing as OSC commented, and a willingness to go forward on the ball which will be hard with HM…. but all in all, it was protectionism and a ‘playoff run’ that kept him from the starting lineup last season…which gives me pause- but hey…. least they didn’t sign an 8 in the off season and this guy is playing in Lancaster. …and now I appreciate some stuff I’ve read from Union HQ regarding Whitecap’s Davies being a 16 year old.. yes, if you can play—- play. Let’s see Anthony Fontana get some runs in on a short week 4 games in 15 days type setting. I’ll lose the game with the potential to be wowed reveling in an Academy kid running with the Big Boys. NP. I think the Davies thing has the possibility to be a real gamechanger. If that kid starts getting some press AND has some real “oh-ah” moments early on…Think of the minds that open on the management side. Think of the inspiration/incentive kids just a few years younger will have if this kids blossoms (unlike Adu). I’m probably overreaching a bit, but this could be a “Tiger Woods/Hello World” moment for MLS. Look at what that did for the PGS Tour and the demographic of the players we see today. To clarify though, the kids are younger, stronger, and FAR more successful than they were pre-Tiger.